Well, what a fantastic day that was, dear reader, as a small throng of us descended onto Newmarket with the express purpose of allowing ourselves to be entertained by horses. And so it transpired! We all convened in the cafe at the National Stud, prior to our 2pm appointment with Jane, our tour guide for the afternoon. A pedagogue for sure, Jane was also extremely knowledgeable about her subject and was excellent company - and value - for a full ninety minutes of commentary and interaction. Our first stop was the stallion house, and 'the boudoir' as it's known (where the boys and girls go bunky-uppy!). We were treated to a parade by a National Stud stalwart in Pastoral Pursuits (winner of the July Cup in 2005, and daddy to ), and a newbie in Cockney Rebel (winner of both the English and Irish 2000 Guineas in 2007). Now then, it's a tricky subject to cover is covering, so let's get it over with (a sentiment echoed by one of the boys here too!). Covering is the act of a stallion hopping on and doing the biz with a lovely young lady horse, with the intent of making a lovely (or at least athletic and therefore lucrative) baby horse. There's a real science to it, and we were all in the thrall of Headmistress Jane as she shared the why's and wherefore's of the covering process. Key stats are that Pastoral Pursuits broke a nine year old record just two days ago, by 'finishing up' in just 45 seconds. On the other hoof, Myboycharlie is clearly somewhat more leisurely as he regularly tops the ten minute barrier. Then it was time for 'here's one I prepared earlier', as we went and bade good day to a relatively new-born foal. I can't quite remember his breeding now - perhaps one of the attendees wrote it down? Leave a comment if you did, please - but he looked a skittish, happy camper. Mum seemed relatively unperturbed by the large gathering who'd convened too. There was barely time for a swift toilet break before we hurtled headlong through Newmarket to the neighbouring village of Exning, home of Harraton Stables and John and Julia Feilden (and some furry friends of ours). We got the full stable tour, including an introduction to a grey horse, Emma's Gift, who won on Wednesday night at Bath (you can see her in the video - she's pretty laid back); and a look at the new recruit who is waltzing by Emma on the gallops. Whether she transfers that talent to the track remains to be seen, but the yard is pretty excited about that one. Always De One came out next, somewhat reluctantly, and she appears to be something of a madam. Physically, she's a beast. A big strong sort who looks like a four mile chaser, she needs to apply herself the job a bit better mentally. Whereas Baggsy welcomed all-comers for a stroke and a polo, it was for the brave and foolhardy only approaching Always with good intentions! Night Orbit was also on parade, and he looks fantastic. He's going to race in the next fortnight, all being well, probably over two miles on the flat, prior to a tilt at novice chases over the summer. After spending a fair amount of time with the Geegeez geegees, John did his party trick, by showing us the full on cordon bleu diet that the horses are indulged with each day. Everything from a multi-vitamin syrup that looked like it was being poured from a can of Castrol GTX to the famously healing (and infamously expensive) manuka honey makes its way into our four-legged racing machines, via molasses, cider vinegar, oats, and the Lord only knows what other natural goodness. Seriously, if there is a better fed string of horses in Britain, I want to grow another pair of legs and live there! After the stable trip, it was time to hit the track. And, ostensibly at least, the track hit back! Results were tough to predict. Luckily for us, though, we had a number of judges in our midst - including Gavin's big-price-tipping brother, Gary, who rolled in with 16/1 Follow The Flag (also put up by Kieran, well done men! ), and Tom Folan at 8's in the last. Sadly, I had my own ideas and, with beer fueling betting (a fatally potent cocktail), I threw much cash at the 'away' meetings, and sustained reasonably heavy losses. No matter, for the weather had done its best all day to crack a smile, and we would now retire to the bar at the Rutland Arms. (Too) many glasses of the black stuff later, and I retired shortly after midnight to my very comfortable lodgings at Mrs Merry's on Birdcage Walk (highly recommended). This morning was difficult, hangover fully resident in cranium, and again I have Mrs Merry's marvelous culinary skills to thank for absorbing as much of my drunkenness from the night before as could have been expected. p.s. Remember to keep an eye out on Tuesday, for a brilliant freebie I've got for you! 2010 Queen Mother Champion Chase Preview: Each Way Banker? So, without further shilly-shallying, let's get on with it. We can see then that the Tingle Creek is THE key prep race, with 6 of the 9 Queen Mother Champion Chase winners finishing on the podium in the Sandown heat. Note, though, that three of those podium finishers failed to win at Sandown before triumphing at Cheltenham in the biggie. Unsurprisingly, all won (including Eddie Bleu, whose best run was actually a 2nd place finish in the previous QM Chase). Four of the nine had won at the previous year's Festival, and seven of the nine had prior course and distance form (note, I am including both old and new courses here, so it's not technically all CD form). Interestingly, perhaps, we note that all of the victorious nonet were French or Irish bred.We can also see that eight of the nine won at odds of 5-1 or shorter, and 7 of 9 were 6-9 years old. Only French breds have won aged 7 or younger since 1997; and only French breds have won aged 6 or younger, EVER! It should also be noted that, although dear old Well Chief will be 11 next March, Moscow Flyer scored for this veteran bracket back in 2005, so it can be done. So that's the stat attack - but what does it all mean? Odds Horse Tng Crk 123 Age '10 Fr/Ire? Master Minded is justifiably favourite, as a two time winner of the race, and current Champion Chaser. But he was less imperious last season than in 2008 (not saying much maybe, as his 2008 triumph was one of the most visually stunning performances I've ever seen! ), and he was beaten in a new race at Cheltenham in November. That race, the Connaught Chase, featured four of the first six home in the 2009 Champion Chase, and it was Well Chief who prevailed. We can expect a much more match-fit Master Minded in March, but this run was disappointing nevertheless. The fact that he was also beaten by Mahogany Blaze, who is a good enough stick, but limited at the top level, says a lot too. It should be noted that he's only been beaten in UK on his first or last runs of the season, which bodes better for MM fans. He might well win again. But 7-4 is not for me thanks. Moving down the card, and they then bet 10-1 (top price) each of four: Twist Magic, Kalahari King, Big Zeb, and Forpadydeplasterer. Kalahari King was just touched off in last season's Arkle, and is relatively unexposed. The problem is that he hasn't run this season and may not run before February. That can't count in his favour, and nor from an ante-post perspective can the fact that the Ryanair Chase has not been discounted yet. Too many question marks to make him a betting proposition. Big Zeb is a swerve as well. This horse makes mistakes, especially in top class races where he's not able to dominate. His only Grade 1 chase wins were in Ireland in a novice and a very soft looking Leopardstown affair. I liked his chance last year, and he let me (and, more notably, himself) down with more dodgy jumping. The way he bungled his way round Sandown behind Twist Magic was further fuel to an already over-heated fire. Readily passed over. Which leads us onto Forpadydeplasterer. The only horse to have ticks in all boxes, he's got CD form having won last season's Arkle (as did Voy Por Ustedes, Azertyuiop and Moscow Flyer first time) ; he was second in the Tingle Creek (as were Voy Por Ustedes and Azertyuiop prior to winning at Cheltenham); he'll be an eight year old next season (which is the optimum age - three 8yo's have won in the last nine years, more than any other; and ten since 1985, way more than any other); and, he's Irish bred. Forpady runs best on decent ground, which he's quite likely to get for the Festival (trainer Tom Cooper was quoted as saying that he hated the going at Sandown behind Twist, and it was only guts and determination that kept him in the runner-up berth). As if all that wasn't enough, he's certain to run in the Queen Mum (barring accident or injury), and his chase record is two wins and six seconds from eight starts. That number of silver medals has to be a concern, but it's worth noting that his two chase wins were the Arkle where he got his preferred ground, and a very soft novice event on debut over fences. He's 10/1 pretty much everywhere, and all firms go 1/4 the first three, so a tenner each way would return Â£35 for a place. I can't see him being out of the frame (though I could see him chasing one home), and I've backed him accordingly. Of the others, Well Chief is loveable in the extreme. In my experience, 'loveable' horses tend to be expensive to follow, as when I backed him in the 2008 renewal where he bailed at the second fence as the even money favourite. I wasn't gloating about my 2/1 voucher any more... He could win, but there are too many negatives (including the fact that he's got glass shins) and he might not even make it to Chelts. Barker is the 'dark horse'. He's got no Cheltenham form - in fact, he's got very little form. He does have a cut and dried verdict over Forpady, though again the ground would have been against my boy and in favour of the plumper of the Two Ronnies... Moreover, he's never raced outside Ireland, and his Topspeed figures give him an absolute mountain to climb. Too dark - don't believe the hype. Petit Robin and Planet of Sound round out the top mob in the betting, and the former was third in the race last year. He's in the right care (Nicky Henderson), is the right age, a French bred (won the last three, and four of the last six), and has scope for improvement. The 33/1 is certainly tempting with the slight caveat that he was withdrawn from both the Tingle Creek and the Peterborough Chase in recent weeks. Still, he's been close to Master Minded twice, and has a bronze medal from last year's Champion Chase, so 'double carpet' may represent very good value. Planet of Sound is a British bred, which is a negative in the race in recent years; was beaten over five lengths in the Arkle by Forpady; and he's been racing over further than two miles, suggesting the Ryanair Chase may be the Festival route. I'm finally back in dear (c)old Hackney, after my sojourn in the States. That was truly an amazing experience, and I'm very fortunate to have crafted a business that allows me to operate anywhere on the planet (as long as there's mains electricity and internet capability - oh, and ideally beer and horse racing!). As wonderful a trip as it was, it is fantastic to be home, despite the temperature differential (from 25C to 0C is a bit of a shocker), and despite my bags failing to arrive with me for the THIRD time during my travels (unbelievable). I'm really looking forward to getting back into the equine swing of things, and have lots planned for next year. In fact, next year, I will be embarking on an additional new role, where I'll be offering some of you the chance to follow in my virtual footsteps (or, more correctly, fingersteps) and start your own business online. Many thanks to those of you who applied for the Irish racing article writer role. Your time and effort in applying is very much appreciated. I'll be going through your submissions over the next couple of days, and will be in touch with all of you to personally thank you and to let you know how things will move forward. Applications are no longer needed, so if you didn't email me already, there's no need to now. Finally, I've news of the Geegeez geegees. Obvious had her first run after a three month injury break last Friday, and it would be true to say we were all rather disappointed. She was going very well at home and, despite it being a weak looking contest,Â she was well beaten. I was traveling so unable to be at the track, and it subsequently transpired that she had a very bad four hour journey in the horse box, due to snow and ice. When she got to Southwell, she got very upset as well. Some of you may have noticed her drift on Betfair, and I imagine the two events were related. As if that wasn't enough, her usual jockey, Amir Quinn, was also struggling to get to the track due to the weather. In the event, we had a claimer on board, and he put Obvious into a six-way battle for the lead. She was very stressed already, and gave best quite rapidly. The long and short is that a) her handicap mark will diminish as a result of this, and b) she is better than she showed. Her next race is likely to be mid-January, and we will hope for considerably better. Baggsy, our other club horse, continues to train up after a slight knock from her last race, and she's being aimed at a race in mid-January as well, probably at Lingfield. This will be her third run in a maiden, after which the handicapper will pass his verdict and we'll see what happens after that. We're very hopeful of finding a race (or two) with her, as the winter progresses. Finally, Night Orbit is doing great. He was pulled from the Ascot race last Friday, and is instead entered at Wincanton on Boxing Day. It's a qualifying race for the Pertemps Handicap at the Cheltenham Festival, and the dream at this stage is to be present as an owner at that great meeting. Running placed or winning is too much to hope for probably, but just being there will be amazing. Fingers, toes and other appendages are firmly crossed. That's all for today and, as there's nowt to note between now and Boxing Day, I'll be taking a few days off from the blog (busy working on those other things I've mentioned in recent posts), but will be back before the New Year. https://www.geegeez.co.uk/wp-content/uploads/2018/09/geegeez_banner_new_300x100.png 0 0 Matt Bisogno https://www.geegeez.co.uk/wp-content/uploads/2018/09/geegeez_banner_new_300x100.png Matt Bisogno2009-12-21 14:01:092009-12-21 14:01:092010 Queen Mother Champion Chase Preview: Each Way Banker? There were two Champion Hurdle trials, in consecutive races, on Saturday. And, bizarrely enough, my very own (part share of) Night Orbit was engaged in one of the two contests! I'll get to that in a moment. The first of the pair, the Boylesports International Hurdle, offered us a rematch between last season's Champion Hurdle 1-2, Punjabi and Celestial Halo. Both are well regarded by me with a view to this season's championship decider next March, and I was most interested to read about the race. As it turned out, though the Halo was sent off at odds on, both he and the Punjabi were usurped by Nigel Twiston-Davies' hoss, Khyber Kim. That beast saw off all comers in very slick fashion and, whilst there was no fluke about this stylish win, KK clearly relished the sodden turf more than his labouring rivals. He's a 12/1 shot for the Champion now, and it may be 12/1 that he gets ground this wet, which I believe he'll need to overthrow his pursuers again. The 10/1 about Celestial Halo, eased from 13/2, should be snapped up if you don't already have him in your portfolio (and even if you do). He'll beat KK on better ground. Punjabi was in need of the run and performed respectably - though no better than that. Medermit remains very interesting. In my Champion Hurdle preview back on 21st November, I'd noted that he had a similar form profile to Binocular but was eleven times the price. He's still 40/1, and I reckon he'll be on the scene come March at a fat juicy price. Next up, and the last race on the card, was the Relkeel Hurdle. This featured a walk in the park for unbeaten 4yo, Zaynar. Up against him were an above average, but not exceptional, lot. And Night Orbit! Zaynar was sent off at 1/5; Orbit at 66/1. In the finish, the race panned out as a stroll for Zaynar. He quickened nicely to win as he liked. Dear old Orbit was beaten less than twenty lengths by the new Champion Hurdle favourite, and finished a very gallant fourth in this Grade 2 affair. I may never get to see a horse in which I have an interest run in a Graded event again, so I was gutted to miss Saturday's race. 1. Zaynar should not have shortened in the Champion Hurdle betting for beating a group of horses who are not even quoted for that race! 7/2 is a joke price, and more reflects the fact that the other horses keep beating each other. 2. Night Orbit was clearly flattered. The fall of Golan Way at the 2nd robbed the race of the most likely front runner and, though 'Ollie' does sometimes go from the front, he had an easy enough time of it, sharing duties with eventual 2nd, Cape Tribulation. The time was slow, and Orbit ran his usual race. No better (in fact, slightly worse) than his Aintree 2nd, according to the speed numbers. He's come out of the race in excellent fettle, and is entered on Friday at Ascot in a Class 3 handicap hurdle. If the handicapper indicates he'll increase his rating, then Orbit will run on Friday. It looks a tougher assignment to get close to my eye, as they're sure to go licketty-split in the likely big field. More as the week unfurls. News from the Geegeez Racing Club... Obvious is now back in fine shape, after her long absence caused by an injury she sustained when running at Goodwood last time. Indeed, she's entered in not one but two races this Friday. She's more likely to contest the 2.40 race at Southwell (a classified stakes), and a fairly average affair it appears too. Of course, it is a challenge to keep our hopes to sensible proportions and - after three months on the sidelines - Obvious may be a little ring rusty. I'll be backing her nevertheless! Baggsy, our other club interest, continues her own recovery from a niggle, and will hopefully be back on the track in mid-January, with a following wind. Back over this side of the pond, and one of the issues with Mexico was that my internet connection would not allow me to access certain sites. 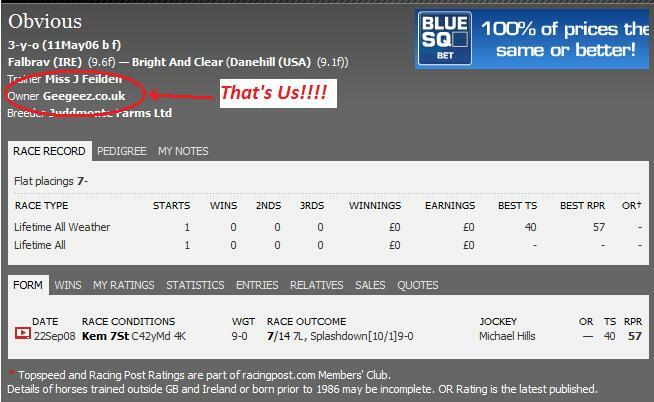 Annoyingly, one such site was www.geegeez.co.uk! As a result I've not been able to update you on the performance of Betfair Renegade. The up to date position is a little disappointing, with a couple of painful reverses over the weekend leaving us at -8.4 points. The material stat for me is the percentage over SP which, at just 11.75%, suggests that the system is worth persisting with, despite it's (temporary?) blip in form. Betfair Renegade has now been pulled from the market, a week later than quoted. This week I'll also be sharing details of a couple of other blogs that I consider well worth a read. First up is my colleague and friend David Peat, who many of you will know from either Flat Racing Profiles or Horse Profiles. David has had a blog for a while, but has recently upgraded it as part of his horseprofiles.co.uk website. It should be said that I am not in any danger of becoming a tourism ambassador for Mexico: it's natural beauty is somewhat subsumed by a level of poverty and a rich/poor divide that serves only to remind me how lucky we are in UK (even those who consider themselves unlucky). A newspaper article on Friday blared in bold font that 65.8% of Mexicans have no access to Social Security. That in a country where that's probably a conservative estimate of the number of people who need it. But it's not my place to make such observations on the socio-political situation there. Rather, I should comment on my tourist experience. On that latter point: despite their poverty (and how easy it is for me to say), the people of Mexico should treat tourists better if they want build a sustainable tourism industry. I will not go back, because I hate being ripped off. The same taxi ride cannot cost twice as much a hour later. Food bills should not have nefarious additional items added to them. And haggling is not a way of life I especially enjoy (though I know others who do). But... but it is a beautiful city, and one full of hope. While we were there, we shared a Christmas parade with this (ostensibly) most devout Catholic country. To see the joy in the children's faces was to be blinded by hope for the future. For someone as cynical as I can sometimes be, that was truly beautiful. So it seems I may be staying in San Diego for Christmas (and New Year too?) after all. My original flight was for 29th December, but I had a change of heart which led to a change of flight to 23rd December, arriving in London on Christmas Eve. Little did I know that the cabin crew at British Airways, with whom I'm flying, have decided to strike from 22nd December until the New Year. At this stage, it looks as though my flight will be canceled, and I will be stranded here. As the flat season winds down, dear reader, it's almost time for the big guns of jump racing to flex their muscles. And, in celebration of all that is good about National Hunt racing, I've got fifteen horses for you to keep very much on the right side of this winter. These horses are not your Kauto Stars or Katchits. I think you could pick those out for yourself. No, these are genuine bona fide dark ones, some of which you'll know; and some of which I'm confident you won't. This list of horses - which is a must for anyone considering entering any of the many fantasy stable / Ten To Follow competitions - comes to you courtesy of TrainerTrackStats, and is part of their great giveaway offer in the run-up to the official launch of TTS, next Monday. As I say, it's a great aid for Ten To Follow players, and indeed the author is a former top 20 finisher in that competition, and can also include a Scoop 6 win in his impressive punting CV. Now there is a slight catch this time... If you went and downloaded Flat Racing Profiles yesterday, you'll know that you didn't have to do anything except click the link to get that. That was a complete 'no strings' summat for nowt offer, to enable you to back the best trends horses for the last six weeks of the season. But this time, if you want the National Hunt fifteen to follow, you WILL have to provide your email address. Please don't worry about this. You're signing up to my best mate Gavin's list, and I promise that he will never abuse that. He will, though, send you a couple more emails over the next few days to tell you about more top quality freebies. As those of you who have been reading my ramblings for any length of time will know, I never pitch crap. I (and my brilliant review team) look at scores of systems and review many of those. If they're bunk, we say they're bunk. And when it comes to freebies, most of the free stuff in this game is free for a reason (see 'bunk' above!). But not these giveaways. These are designed to showcase the research brains behind TTS and similar products (like Flat Racing Profiles), and I'm immensely proud to have been directly associated with both products. I know many of you consider them to be the best stuff out there as well. Anyway, enough of my sycophantic and self-congratulatory bluster... Just go and get some more great free stuff, courtesy of Geegeez, and my mates in the game! Playing catch up somewhat this week (it seems that way every week at the moment! ), and I have to report news of Baggsy, who ran on Monday in a fillies' maiden over seven furlongs at Kempton. The race looked pretty hot on paper (1000 Guineas winner Ghanaati finished 3rd on debut in the same heat last year), and Baggsy ran a spirited race full of promise. Sent off at 66/1, she traveled quite well and stayed on at the one pace when she came under pressure. Although beaten around ten lengths at the line, she's unlikely to ever race against horses this good again, and will have plenty of winning chances over the winter. If you're interested in learning more about Baggsy, click the 'Geegeez Racing Club' link at the top of this page. Obvious, for her part, has been given a handicap rating of just 55, which she should be able to win off. Unfortunately, she got a little sore in her shoulders after running on the firm ground at Warwick last time, and she'll need a couple more weeks before returning to the track. But, with going, trip and class of opposition all likely to be much more in her favour, we'd be hopeful of a significantly improved showing. A mixed bag to get through today, dear reader, as I attempt to tidy up the business of the week. Firstly, I've news of the Geegeez Racing Club horses, Obvious and Baggsy. As many of you will know, Obvious had her second run for us, and third overall, when finishing down the field in a Goodwood maiden on Tuesday. The trip was on the long side for her, and she hated the ground, which was too firm. However, despite that, she did break well again and traveled kindly until running out of gas around two and a half furlongs out. That was Obvious' third run overall, and she will now qualify for a handicap rating. The handicapper will publish his verdict of her merit next Tuesday, and all eyes will be on that information. We hope that she will get a rating of somewhere between 55 and 60, which will enable her to be competitive in races at that level. Whatever the determination of the handicapper, Obvious will have a mini-break of about four weeks now prior to her next run, which will be on either softer ground or the all weather. We look set to have a lot of fun with her over the winter, when she gets the chance to race at her level. I've also got an update on our other Geegeez horse, Baggsy, who has been progressing well at home. She's never been to the track as yet, and is a two year old sister to two winners in Julia's yard. Baggsy will make her debut in a fillies' maiden at Kempton Park on 21st September, over seven furlongs. She's bound to improve for the experience, never having seen a racetrack before and, as we've got to start somewhere with her, we'll see how she goes. There's still a few shares available in Baggsy so, if you're interested in being a part owner and joining the Geegeez Racing Club, then click this link here: join the Geegeez Racing Club. Now then, I happened to watch a certain game of football last night, between England and Croatia. I have to say that I've rarely seen England look better - in fact, I can't remember ever seeing them play better - than they did for about 75 minutes last night. They were fiercely determined, worked exceptionally hard, showed real attacking intent all over the pitch, and could have scored eight! In winning 5-1 (there's something about that scoreline), they booked our place at next year's World Cup. Well done boys! For the Scots, Welsh and Northern Irish, the news was less good. The last named can still qualify but Wales and Scotland it's another four years wait alas. Finally, on the subject of footy, well done to the Faroe Islands, who managed to beat Lithuania last night to record what must be only their third or fourth ever win. Great work! Back to the horse racing, and today sees the start of the three day St Leger meeting from Doncaster. The big race itself suffered a setback today when it was announced that ante-post favourite, Age Of Aquarius, will now not take part, due to Aidan O'Brien not being "entirely happy" with his colt (whatever that means). So we're down to the dead eight for the Leger, and my ante-post ticket, Monitor Closely - having been supplemented - is now a 9/2 chance (as low as 4/1 in some places). His odds have been restless ever since his emphatic four and a half length win in the Great Voltigeur Stakes at York and, having seen a high of 17.0, are now into 5.7. I wish I could say I got a great price, but 8.22 wasn't even the best price available in the hour I placed the wager! Such is life. It's often a tricky race to predict the winner of, and so I'm interested in your thoughts. I've put a poll question up top right, where you can share your idea of the winner of the last Classic of 2009.
Who do you reckon? And, if you want to make a case for your choice, feel free to add a comment below. Lastly today, it's Thursday, so let's have a spot of fun. My thanks to Dave "Cheap as Chips" Dickinson for sending me this. It's either a remarkable piece of camera jiggery-pokery, or a masterpiece of engineering calculations. Either way, it's a dandy enough spectacle! p.s. Don't forget to add your thoughts on the St Leger below. It is most ironic, dear reader, to this commentator at least, that the fact we've been deprived of the greatest flat jockey of his generation for eighteen months has to do with the administration of a banned substance. Unfortunately, the banned substance was cocaine, and it was administered to himself sufficiently close to a riding engagement in France that it was still in his body when the test was taken. Careless, reckless, sometimes feckless: that's our Kieren. Of all the things that have happened during his career, to be banned for snorting white powder is madness. (Note, I in no way condone the use of drugs, hard or soft, with the exception of alcohol... ahem). Following a strong lineage of flawed Irish genius, from the dazzling trickery of George Best, through the sheer natural brilliance of the 'Hurricane', Alex Higgins, to the brute strength and unquenchable desire to win of Kieren Fallon, Ireland has long been a nation that celebrates its' sporting heroes. And perhaps from the very core of the Irish conscious comes this fragility; this ultra-human quality that is at once so endearing and so frustrating. Now, as a non-Irishman who puts words before the eyes of many better qualified readers, I'd be more interested in the views of those who know than my own conjecture on this subject. No matter, for - time served - Mr Fallon will be back riding tomorrow. And his first mount back in public and in competition will be for none other than... erm, Miss Amy Weaver. Who?! Well, I've never heard of her, but she had a winner yesterday with Boquito and her runner tomorrow - Rare Malt - has the best public form. There are numerous debutants from decent strings, and it's to be wondered how many of those Fallon might have had the offer of the leg up on, given the pertinence and publicity that is bound to be afforded his first return winner. The man has a pretty full book tomorrow, with Rare Malt (2.20) followed by Roodee King, Diriculous, and Satwa Gold at Lingfield, before he scoots across to Kempton for evening action aboard Wigan Lane, Arte Viva and Bugaku (they might even get a fee-paying crowd into double figures!). Seven rides on day one of his comeback - Fallon is a man who doesn't believe in easing himself in gently! At 44, the bones won't be any younger but he probably has another two or three years at the very top, before deciding what next. He may be a courter of controversy, and far from the ideal role model for young equine enthusiasts but, as a punter, I, for one, cannot wait to see this brilliant, brillant jockey back on a horse I've backed! Now then, it was a busy Bank Holiday weekend for me, and you'll have read and watched my journal from Bratislava earlier in the week. Today, I've melded together my Warwick footage, from Obvious' first run - and indeed Geegeez Racing Club's first runner - on Monday. Again, please bear in mind that I'm the most amateur of amateur videomen. I'd never even used a camera before I started doing bits for the blog, and I don't record anything else, so I've shot just a handful of clips in my life. With that apologetic caveat in place, and please bear in mind that I was sleep deprived due to another flight delay on the way back from Bratislava (you'll see what I mean when you click 'play'! ), run VT! Finally, did anybody else see Dragon's Den last night? Although I think this programme is pretty good, I don't watch it very often. It's remarkable (and remarkably dull, in my opinion) how often these gurus of business lazily 'piggy-back' on the point one of their colleagues made, no matter how obtuse it is. It's not clever to copy someone else without adding any colour or inference of your own, and Dragon's Den - whilst compelling TV - could be so much better, I reckon. Anyway, I did actually get to enjoy a rare 75 minutes of gogglebox last night (the other hour being the funniest Family Guy episode I've ever seen, and Shooting Stars - consistently ridiculous). The reason I mention this was that racehorse trainer Edward Creighton and some self-styled 'lord' (when pressed, he simply said, 'Well, I look like a lord'. He looked liked an idiot). Their 'idea' for which they wanted funding was for a brilliantly innovative business, which they called TURF. It stood for something, but was basically a racing club. The business model was predicated on 500 people paying Â£1,500 to take a share in ten horses. Now let me help you with the maths here: that's three quarters of a million moolah for ten beasts in training. It costs about fifteen grand plus VAT to train a horse for a year, and an average horse will sell for say ten grand. Thus, each beast would cost around Â£28,750 (funnily enough, exactly the fund Geegeez Racing Club raised for Obvious, with the difference between the purchase price and fund allocation being distributed pro rata at the end of our year). Ten of those comes, by my rudimentary arithmetic, to Â£287,500. Okay, let's be generous and suppose that Creighton and 'The Lord' were going to spend Â£20k per horse. Including VAT, etc, their costs would now be Â£40,250 per horse, or Â£402,500 in total. Where the hell was the other Â£347,500 going?????!!!! At the risk of getting in trouble... Edward Creighton... Buffoon! (And arguably a crook to boot, but only arguably - don't quote me on that). It was with a mixture of immense pride and huge trepidation, dear reader, that I traveled up to beautiful Warwick yesterday. The purpose of my mission? To greet my fellow Obvious co-owners, and to cheer the same beast in her first race for us. It was great to see some of the Geegeez mob there. The idea of the Racing Club is predicated on it being a social setup, where some of us like-minded individuals get together, have a drink, and talk ponies (or pony, if you like). I know those of you who were in the Owners and Trainers Bar with me yesterday had a good time, as did I with you! I thought Obvious looked fantastic beforehand, and she took everything so calmly, which was brilliant. You never quite know with fillies how theyâ€™re going to react on the track. She bounced out of the stall, and seemed plenty keen enough (whilst not actually pulling too hard, if that makes sense). Towards the end, she definitely got tired and Amir stopped riding (rightly, in my opinion) over two furlongs out, so the final finishing position is not as accurate as it might be. He also suggested afterwards that the trip was probably a bit on the long side, so she'll likely come back to around a mile or a mile and a quarter next time. Iâ€™ve emailed Julia to see how she came out of the race (Obvious, not Julia!). She looked fine immediately after, but thatâ€™s not always the full story is it? That's all for now, but I'll be back later with some more video (hopefully!). Geegeez Racing Club: Obvious Runs Next Week! It is with unbridled excitement, dear reader, that I can today announce that our very first Geegeez Racing Club runner has been entered, and is due to take her chance early next week. Now it stands to reason that after a year off, and with some thoroughly unexposed animals set to line up against her, Obvious has it all to do. Expectations for this seasonal debut will be pitched accordingly, and I'd encourage those of you who might want to share in the story with an investment to keep stakes toward the lower end of your normal range. I hope I'm wrong, and that she proves too good for them, but Obvious' targets are later in the season, and a good performance on Monday can be classed as a serious bonus. As if that wasn't enough excitement for one day, I've got more great news for the rest of the racing year. My great mate, Gavin over at Nag-Nag-Nag, is progressing well with his perennial winter bookie-buster, Trainer Track Stats. Once upon a time, a long time ago (August 2006), a young man by the name of Matt Bisogno had a vision to create a new benchmark in the world of racing systems products. Although he had no experience of such things, aside from his own betting habits, and an ardent desire to 'raise the bar' from its hitherto far from lofty base, Bisogs was determined to change the hearts and minds of ordinary, good punting folk for the better. His goal was to create something that was simple to follow, that contained a work of real quality, which was sustained by logic and a past track record, and that was accessible to his fellow betting everyman. And so it was that from the white heat of his analytical furnace, the very first TTS was hewn. Rough around the edges, its presentation sacrificed for the pure goodness contained within, TTS became an instant hit in the latter part of 2006, and was followed by flat and jumps versions each season until this Spring. Collectively, the TTS and TFS manuals have sold over 2,000 copies, and are feverishly anticipated by their veteran followers. But the story is not as simple as that... it never is, is it?! In June of last year, Bisogno took a job as General Manager with a major marketing player, Tim Lowe, that required him to give up his current business in order to avoid a conflict of interest. Specifically, this meant a new owner had to be found for both NagNagNag and TrainerTrackStats. Sale was briefly considered but then dismissed, before Gavin stepped up to fill the void. With no experience of the internet (though a blue blood breeding in horse racing and betting), it was an extremely tough ask. Many of you will know what an excellent job he's done, not just with Nag3, but also with his own 'brand', Festival Trends, which has enjoyed a tremendous run of success and quickly established itself as a keystone in trendsfolk's (I just made that word up!) punting arch. History shows that my career with Tim (wonderful man, brilliant marketing mind) lasted all of two months, and it was 'start again' time for me. Time to find a new online home, and to find some new readers (as well as some loyal former readers - thank you, guys!). Gavin and I joint launched TTS last year. This year, it is all his own work. My role has been little more than consultant data analyst, providing opinion on sample sizes, overall number of runners, wins to runs ratios, betting profit projections and such like. And I have to tell you, Gavin's done a fantastic job. I won't bore you with the comparative stats (yet! ), but suffice it to say that this season's TTS more than stands comparison with its predecessors, and there's a LOT to look forward to this winter jumping season. What with TTS and Obvious, it's been a seriously red letter couple of days for me, and I know that many of you will share in my excitement over the coming days, weeks and months. If you missed out on the chance to get involved with Obvious, don't fret. There is another Geegeez Racing Club horse who will be due to run in about two weeks time. Baggsy is currently in full work, and will race either on soft ground (which he may well get as we stand on the precipice of summer, overlooking another soggy autumn) or on the all weather. Again, his future will lie in winnable handicaps, so anything he achieves in his first couple of starts will be a pronounced bonus (pronounced, 'boh-nuhs' apparently). If you'd like to be a part of Baggsy, as many of you already are, please click the link below, read all about it and, if it sounds like your kind of fun, you can sign up there. I'm really looking forward to meeting some of you guys at the track soon! Right, too much excitement for this boy. I'm off for a lie down, to dream about our horse coming home in front, and greeting her back in the winners' enclosure, before cracking open the champagne with the rest of the Geegeez Racing Clan... ah, sweet dreams indeed. https://www.geegeez.co.uk/wp-content/uploads/2018/09/geegeez_banner_new_300x100.png 0 0 Matt Bisogno https://www.geegeez.co.uk/wp-content/uploads/2018/09/geegeez_banner_new_300x100.png Matt Bisogno2009-08-26 12:10:022009-08-26 14:59:41Geegeez Racing Club: Obvious Runs Next Week!